SarahViz.com: $100 Slow Cooker Giveaway! It's that time of year...there's a chill in the air. Coats, boots and gloves become habit. Snow dusts the bare tree branches...and you start to crave those satisfying home-cooked hearty meals. I don't know about you, but in my Trenches, my poor crockpot sits unused for about 8 months. But man, once November hits, I am jonesing for Winter Meals like the ones I mentioned above. PLUS, being a full-time working mom, knowing that I can walk in the door that night with the realization that dinner is pretty much already prepared? WIN. 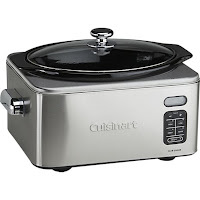 Courtesy of Relish!, I have the privilege of giving you, one of my readers, an awesome slow cooker from Crate and Barrel! 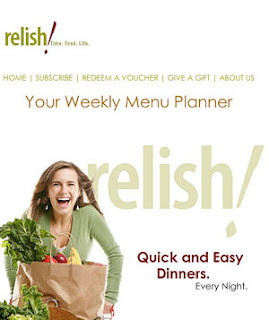 So, who the what is Relish!, you ask? It's simply an awesome menu-planning site. For just $7 per month, they load you up with healthy, delicious, and easy dinners. You get menus, recipes, grocery lists, a mobile app, specialty menus, weekly features, and more. Each week you can choose from their 15 different recipe ideas, and cater them to your family's needs, from 2 to 8 servings. Once you select your meals, a detailed grocery list is ready-made. And best of all, the meals take just 30 minutes or less to prepare! Want 20% off to join? Just enter TRENCH at checkout. Good until December 31st! But now, on to the part you've been waiting for, the fabulous giveaway! Simply leave me a blog comment with 1) your favorite slow cooker recipe and 2) your e-mail. Winner will be drawn at random on Wednesday, December 5. I cook it on LOW all day. When I get home, I remove the chicken and dump in a bag of frozen egg noodles. While the noodles are in the sauce, I shred the chicken and dump it back in the crockpot. After about 30 minutes, the noodles are cooked. This can be served as-is with a veggie, or my family loves to serve it on top of rice or mashed potatoes. My favorite meal is a simple chicken. I put the chicken in the crockpot with garlic cloves, salt & pepper and cook it on low for 6 hours. It falls off the bone and is perfect with a variety of sides. The leftover chicken is used for pot pie, enchiladas, or soup. I love to put a whole chicken in the slow cooker (on top of a heap of cut-up carrots, celery, onions, potatoes, and sometimes parsnips), season it salt/pepper and maybe herbs d'provence or Trader Joe's 21 Seasoning Salute, then leave it on low all day. Easy prep, plenty of leftovers, and so nice to come home to! I have recently discovered how to make my own pulled pork at home in my slow cooker. It is dangerously good! Rub the mixture all over the roast and place in slow cooker on low 7-8 hours. Add a 1/4 water to the bottom. Shred the meat and mix with your favorite BBQ sauce and serve on warm bulkie rolls. My favorite sauce right now is Sweet Baby Rays! Yum-O! Make sure to spray bowl of slow cooker well to prevent sticking. Simply mix ingredients and go to bed! 6-7 hours on low is best but 8 is ok. Sometimes I add in sliced apples and cinnamon before cooking, other times canned pumpkin at the end, then the fixings. Makes a big batch so you can eat all week, and my kids love it! My favorite slow cooker recipe would have to be short ribs! Beef stew w/ beef check, celery, carrots, corn, potatoes, and onions! Yum and perfect on a winter night! I love slow cooked pot roast for the winters! Spread the flour out onto a work surface. Sprinkle the chuck roast with salt and black pepper, and roll the roast in the flour to coat all sides. Pound the flour into the meat. Place the floured roast into the cooker on top of the onions. Whisk together beef gravy mix, ranch dressing mix, and Italian dressing mix in a bowl, and whisk the mixes with water until smooth. Pour over the chuck roast. Distribute carrots around the meat. Then serve with rice or tortillas and enjoy! This is probably the EASIEST!! I love using my crockpot but the handle is broken, so we would love this new swanky one! We are a football/cheer family and love making chili to take to the game (also doubles as a handwarmer). My no-bean chili varies depending on what I've got in the fridge, but basically you cook in the crockpot for about 5 hours on low (stirring occasionally during commercial breaks) the following: 4lbs of lean ground beef, frozen is fine; one diced onion; three cans of diced tomatoes; one jar of garlic & onion tomato sauce (I like Paul Newman's); and spices to taste like cumin, chili, cilantro and of course pepper and kosher salt. You really don't need too many spices if you use flavored tomato sauce - especially if you have picky eaters. A favorite for sports nights with kids in practices that span 4 hours and family dinner becomes eat when you can. Slow cook on low for 8-10 hours or 4-6 on high. Remove chicken from the crockpot and shred. Remove half of the remaining liquid from the crockpot and set aside. Add the shredded chicken back into the crockpot with the remaining half of cooking liquid. The chicken should absorb the cooking liquid, add more of the reserved liquid as needed to keep moist. I regularly double the recipe with the hopes of freezing for another meal (freezes well). The family regularly foils this plan and request that this be packed as lunches for the rest of the week. Holds up well to thermos lunchbox packing with a side of veggies and tortillas chips. On nights when I am chief chauffeur, I fill plastic containers with lettuce, olives, cheese, tomato, guacamole and stack in the fridge next to tortillas, sour cream, and salsa and the kids and hubs grab and go as schedules allow. People in Poland do not know slow cookers. Once I had a chance to try Murphy Richard's Intellichef and I loved it. The best recipe was stupid-simple and very tasty beef&cabbage stew. Rinse chicken; pat dry. Rub the spices all over the chicken; add a chopped onion to the cavity. Place chicken in crockpot. Do not add any liquid. Cook on low 8-10 hours or on high 4-6. Soups, stew, chili, baked beans, apple butter, pumpkin butter. YUM! I've tried every one of these recipes from Oh She Glows and each and EVERY one of them has turned out perfectly in MY MOM'S slow cooker (which I borrowed because she has only used it about a dozen times) lol. Begin by cutting excess fat off ribs. 1. Season ribs with salt/pepper. 3. Dice up the onion, add to slow cooker. 4. Place ribs in layers on top of onions, Dumping BBQ sauce on top of each layer of ribs as you go. 5. Cook on low setting for 8-10 hours. 6. Try not to lift the lid while cooking.